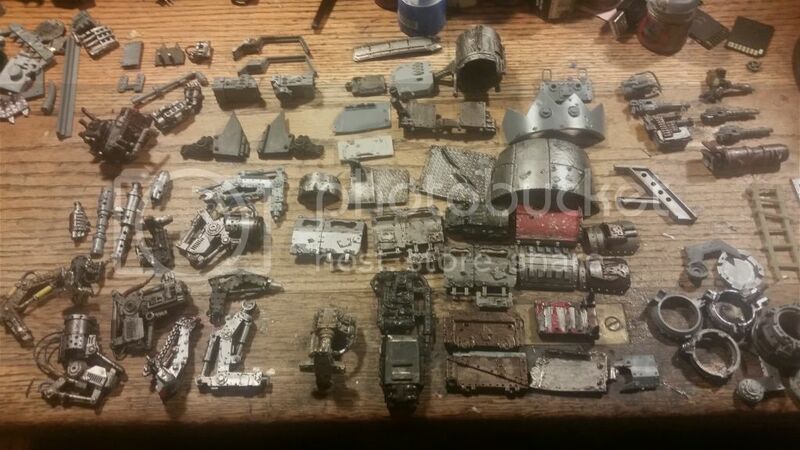 All this to say, I still need to build a Lifta-Droppa arm, I don't want to shell out fifty bucks to get the Forgeworld arm, and I don't really know where to start. Does anyone have any tips for what I can use to build this arm? Like I said, I've got a ton of orky Bits lying around (As well as plenty of Space Marine bits,) as well as a little plasticard and styrene rods. If you've done any scratch-build projects, have seen cool ones online, or just have ideas, I'd really appreciate your input! If we could see what kind of bits/pieces and sprues you have avilable that woud help. My main thought would be getting a few different thicknesses of plastic rob pipe, and plasticard. You should be able to get that kind of material at a decent price from Hobby You should be able to remake the weapon with that, and as its Ork, you don't have to be too clean with your cutting and shaping. The trickiest part will be the shoulder joint. Do you have anything to help there? Here's all my bits that seem useful. Well, I got it done, and it doesn't look half bad if I do say so myself.